Note – we also have this program available with less trekking, as a jeep safari tour with fixed date departures too! This trek takes you from one village to another in the high mountains of Spiti. For 3 days you’ll be spending time above 4300m. The trek starts at Langza, the village situated under the shadows of 6303m peak Mt. CCKN; then it goes through Hikkim – the village with the highest post office in the world, send postcards to your friends and family from here; before we head to the highest village in the world with a motorable road – Komic. The village of Demul gives a unique insight into the community run homestays. 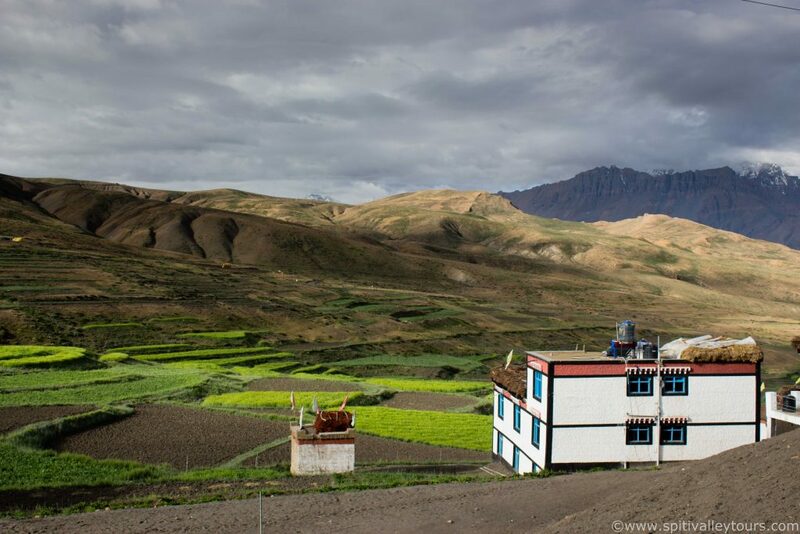 Lhalung and Dhankar have ancient monasteries that blend in with the harsh landscape of Spiti. Our Homestay Trek is very important to us, unlike most tour operators operating from outside of the valley, we do not keep our guests in tents in order to maximize profitability. Instead, we believe that tourism is a vital resource for all Spitians and place priority on equitably sharing the revenue we bring in from our guests with our local community; for this reason whenever possible we stay in local homestays. Community Based Tourism has always been at the core of our principles here at Spiti Valley Tours and we take pride in it. If you don’t see a village on this itinerary, we have over 22 villages and hamlets in our network in Spiti and the surrounding valleys and are always happy to arrange custom programs of any length for those who would like to stay in a Himalayan village for a few weeks or months it can be very, very rewarding and a life changing experience. We pick you up from your hotel in Kaza and drive to the village of Langza. On the way we visit Kee monastery, the most popular destination of Spiti Valley. Today is the day of acclimatization before the trek as you rest and relax at an altitude of 4350m. Take short walks around the village, visit the large Buddha statue and take numerous photographs with Mt. Chau Chau Khang Nilda in the background. Today is the first day of trek. We climb the hill around Langza along the road that goes to Komic. The trail gradually ascends and before flattening out. A short descent from here will take you to Hikkim, the first village you’ll see on the trail. Visit the highest post office in the world and post postcards to your friends and family. From here Komic is 2 Kms away. After reaching the homestay in Komic visit the two monasteries atop and enjoy refreshing cup of seabuckthorn tea at the organic restaurant. Langza along the road that goes to Komic. The trail gradually ascends and before flattening out. A short descent from here will take you to Hikkim, the first village you’ll see on the trail. A long day of trek awaits over the undulating hills. The trai from Komic immediately climbs up to the little pass ahead. You’ll cover long distance over this terrain, on the way you may find several domestic yaks grazing over the meadows. After around 6 hrs of trek under the scorching sun you’ll find a little village ahead with vast green cultivation fields in the depression between the mountains this is Demul. Relax in the homestays or take walks amidst the fields. It’s all the way down to the Lingti gorge from Demul. The trail leaves the high plateau of Demul and starts climbing down immediately through a series of switchbacks. The loss in altitude is significant as you climb down almost 1000m down to the bottom of the gorge. The river in the gorge is called Lingti. From here the trail climbs up again for another 400m gain in altitude till you reach the village of Lhalung. Visit the 1020 year old Serkhong Gompa or The Golden Temple with its beautifully painted golden roof shining among the dry mountains of Spiti. Easiest day of trek, the trail is mostly along the asphalted road for 3 hours till you reach Dhankar but not without the grand views of Spiti Valley. Halfway through the trail you can see the Demul village high above on the opposite side of the valley. As you get closer to Dhankar you’ll leave Lingti gorge behind. The view of confluence of Spiti and Pin rivers far below is a sight to behold. Dhang means cliff and Kar means fort, the fort situated at the edge of a cliff, Dhankar. Built 800 years ago on the edge of a 300m cliff Dhankar monastery is one of the endangered archaeological sites in the world and a masterpiece of ancient construction. Dhankar was once the capital of Spiti during King’s reign before the modern administrative capital shifted to Kaza. After seeing the monastery one can trek to the Dhankar lake situated above the village. This is a small yet beautiful lake situated in the depression between the mountains is fed by melt water from snow. The trek completes after you return from the lake and we drive back to Kaza.